The House just passed a 3-month PATRIOT Act extension 279-143. Here’s the ACLU’s statement. Julian Sanchez’ post from yesterday discusses why this is (relatively) good news . And as EFF tweeted, we have three months to organize. Here’s a Doodle poll for our next organizing call. Please let us know when you can make it! The grassroots anger against the PATRIOT Act is real across the political spectrum. So is the fear. And I agree with the politicians on both sides who said there’s a lot of misinformation out there. So over the next three months we need to do a lot of education, and get our message out in a way that’ll be heard. And we need to make sure politicians get an earful from their constituents over next three months. The PATRIOT Act is an emblem of the kind of government intrusion the Tea Party and Libertarians loathes. So the Tea Party caucus — and every politician facing a likely Tea Party or Libertarian challenger in the 2012 primaries or general election — will be thinking very carefully about their votes. And ditto for progressives (and politicians facing progressive challengers). For almost ten years, the PATRIOT Act has been an embarrassment to our country and even most of the politicians who have voted for it. One way or another, it’s time to do something about it. * speaking of which, for those of you on Facebook, here’s info about a March 12 protest in DC to repeal the PATRIOT Act. House debate happening NOW, SJC meeting at 10 a.m. The House debate is on CSPAN. We’re hanging out in the chat room at on http://bit.ly/feb17chat … please join us! The Senate passed a three month extension. The vote was 86-12. Sens. Baucus, Begich, Brown, Harkin, Lautenberg, Lee, Merkley, Murray, Paul, Sanders, Tester, Udall voted “Nay”. Today’s House Floor Schedule includes possible consideration of the Senate’s amended version of H.R. 514 . The Hill reports that the rule for considering the Senate bill is likely to be passed today, with the vote either today or tomorrow. The bill I introduced on January 26, and that the Judiciary Committee is scheduled to consider this week, is based on the bill the Judiciary Committee considered and passed with a bipartisan majority last Congress. It includes additional adjustments made at Senator Kyl’s suggestion after the Committee reported the bill in 2009. I will urge the Judiciary Committee to report that legislation again, and I will urge the Senate to consider and pass the improvements to the USA PATRIOT Act that we have proposed, during this short, additional three-month extension. The vote was 86-12. The Hill has the details, and here’s the roll call vote. On our planning call last week the consensus this was the least awful of the options. So, thanks to everybody who got involved and made enough noise that they couldn’t sneak through something more awful! And now, looks like we’ve got some serious organizing to do. Stay tuned for more. 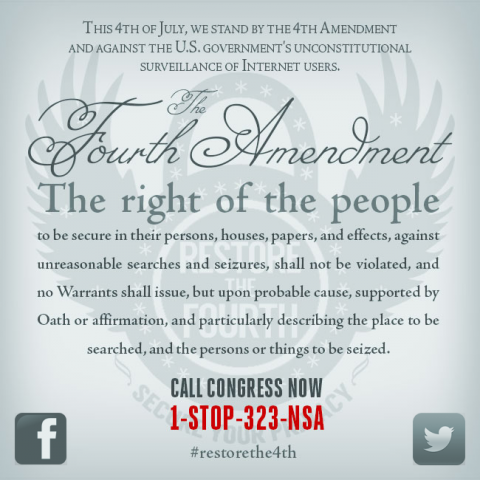 Patriot Act reauthorization passes the House — on to the Senate! Tonight, members of Get FISA Right joined to watch live coverage of the debate on HR 514, extending 3 controversial provisions of the misnamed (to editorialize) PATRIOT Act. The bill passed 275-144, with 27 Republicans voting no. We were saddened by the outcome, but saw some encouragement as a number of representatives rose to speak about the necessity of preserving constitutionally-protected civil liberties, especially those protected by the first 10 amendments to the constitution, commonly known as the Bill of Rights. EFF’s action alert has more details. Now the debate moves to the Senate, which is expected to vote on Feinstein’s S.289. Sen. Feinstein’s bill would, without introducing any new reforms, reauthorize the PATRIOT Act until 2013. Please contact your Senators and urge them to oppose S.289, and to support the reforms in S.193 (Leahy’s bill) and the JUSTICE Act (S. 1686 from the last Congress). As always, we welcome discussion here as to what further actions we should take as a group. It’s Valentine’s Day! And tonight at 6:30 PM Eastern, the House is once again voting on HR514which extends the PATRIOT Act until December of this year without introducing any reforms. There’s an hour of “debate” scheduled at 2 p.m. Eastern. Julian Sanchez’ Now what? is a good overview of the issues and The Heritage Foundation on the PATRIOT Act demolishes the arguments for extending it unmodified, and GOP Rep: I made a ‘terrible mistake’ in last year’s PATRIOT Act vote highlight that civil liberties is a multipartisan issue: libertarians, progressives, tea partiers and more and more conservatives and moderates are saying “enough!”. Please urge your representative to no, and ask her to support reintroducing the JUSTICE Act instead. Phone your representative at (202) 224-3121, use POPVOX to say “vote no on 514“ and demand JUSTICE, and weigh in using email via Demand Progress, ACLU, EFF, or Downsize DC. Get FISA Right will be getting together online during the debate and during the vote. There’s also a Day of Action on Facebook and elsewhere. Details on all of this coming soon — watch the blog! weigh in using email via via Demand Progress, ACLU, EFF, or Downsize DC. ACTION ALERT: House PATRIOT Act vote on Monday! Monday at 6:30 Eastern, the House is once again voting on HR514, which extends the PATRIOT Act until December of this year without introducing any new safeguards. So please try to find time this weekend to get involved and get the word out! Then help get the word out! Get FISA Right will be having a chat during the vote on Monday — watch our blog at https://getfisaright.wordpress.com/ for updates. Have a great weekend … and make some noise! You are currently browsing the Get FISA Right blog archives for February, 2011.